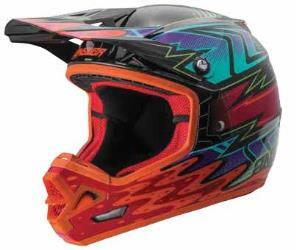 Style and performance combine with safety in the all-new Answer Racing AR-3 helmet. D.O.T. and ECE-certified, comfort is addressed with our intermediate-oval shell shape and uses top-of-the-line SilverCool evaporative cooling in the interior. SilverCool wicks away perspiration and dries faster than non-treated materials, plus it is anti-microbial to help eliminate odors between washes. The shell design features exceptional venting, a strengthened chin bar and large eye port that accommodates most goggles, including over the glasses types.